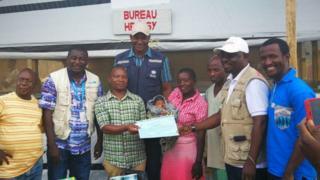 Baby Benedicte's mother was infected with Ebola and died during childbirth. "Her father, Thomas, was very emotional… she is his first baby," a health ministry spokeswoman told the BBC. Tales of survival, like Benedicte's, are rare. The little girl has become known as the "miracle of Beni". The World Health Organization says the situation in the country is "concerning" and there remains a "very high risk" of the outbreak spreading further.